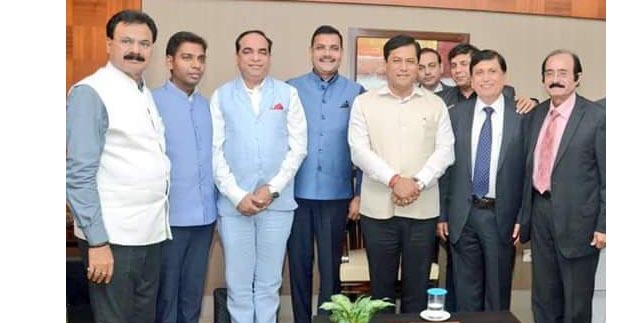 A business delegation of Non-Resident Indian (NRI) on Monday met both Assam Chief Minister Sarbananda Sonowal and Assam Minister of Transport, Industry & Commerce, Parliamentary Affairs, Skill, Employment & Entrepreneurship Development in Guwahati. The delegation from China met the Assam Chief Minister at the latter’s residence in the city. During the meeting, the Chief Minister discussed with the delegation about promotion of ‘Brand Assam’ in neighbouring China. They also had discussions on various investment opportunities in Assam. The NRI businessmen’s delegation from China also had a meeting with Assam Minister of Transport, Industry & Commerce, Parliamentary Affairs, Skill, Employment & Entrepreneurship Development Patowary on Monday. During the meeting, they also discussed on various investment opportunities and regarding promotion of ‘Brand Assam’ in China. According to information, the 6-member delegation was led by China Trade Forum CEO Puran Jeswani. The delegation’s meeting with Industry & Commerce Minister Patowary was held at his office in the city. During the meeting, Ravi Capoor, Additional Chief Secretary, Industry & Commerce and other senior officials of the department were also present. “First of all, Ravi Capoor briefed about the business opportunity in Assam, and also introduced the new investment policy of State. The delegation expressed willingness to work with the Government and set up business establishment in Assam,” informed official sources. The delegation also promised that they will bring Chinese investment to Assam. During the meeting, the areas identified for investment are – bamboo, tea, plastic, fruit, organic food, petrochemical. The delegation was informed that the Assam Government has decided to connect with China by air, and talks, negotiation are underway. Guwahati to Kunming/Guangzhou would be linked and air connectivity will cut down travel distance which will give boost to business communication. Kunming to Kolkata (K2K) Forum is the only civilian forum between India and China, which provides platform to form communication and exchange of Idea for business, academic & people to people to contact. The delegation made a proposal to Assam Government to host 2019 K2K forum meet in Guwahati and in K2K, Guangzhou to be added in the forum.